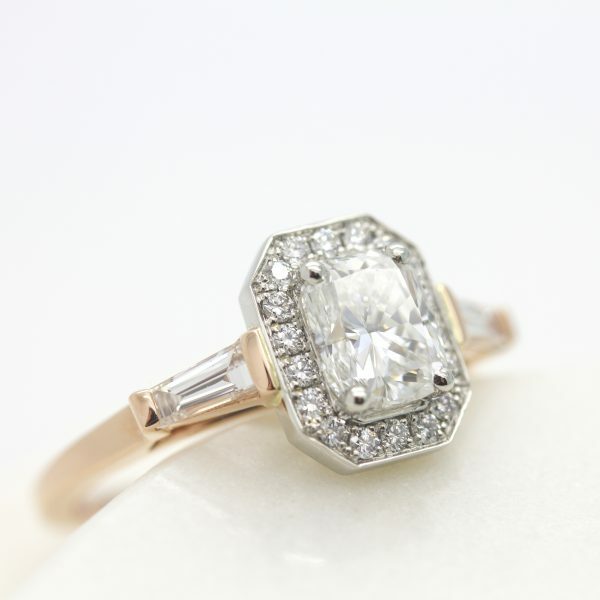 A relatively new diamond shape, the radiant cut was designed by Henry Grossbard in the late 1970s. He created a cutting technique that combined the best elements of emerald and round diamond shapes–allowing radiant diamonds to exhibit incredible brilliance and fire. What is a radiant diamond? True to its name, this cut is truly radiant. While the octagonal shape and cropped corners do make it similar to the emerald cut, the faceting is reminiscent of the round brilliant cut. This combination gives radiant diamonds considerable fire and sparkle. With 70 facets, the radiant cut is one of the most brilliant diamond shapes available today. 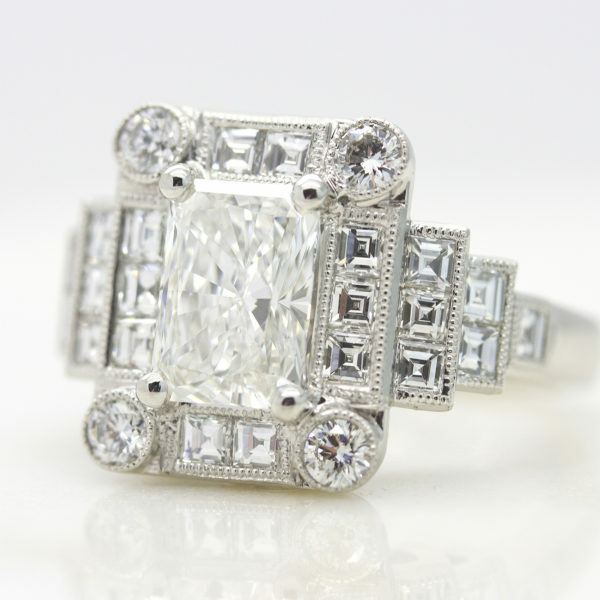 It’s a new cut, created just over 30 years ago by master diamond cutter Henry Grossbard who worked to combine the best elements of the emerald and round brilliant cuts. The radiant is often labeled as a cut-cornered rectangular or square modified brilliant by the GIA when grading diamonds of this shape. Why should I choose a radiant diamond? Radiant cut diamonds possess a silhouette shape very similar to an emerald shape, but its facets are cut in a more similar way to that of round diamonds. This means that the appearance of the diamond has an effervescent sparkle, hypnotising those who catch its gaze. Though the radiant has only been available for a short time, it has quickly increased in popularity. You’ll always find the radiant listed in the top ten most popular diamond cuts. Radiant cuts are perfect for those loving the contours of an emerald cut but craving the sparkle of a round brilliant cut diamond. Radiants are also ideal cuts for coloured diamonds. Due to its faceting structure, this cut provides a depth which emphasises the colour tones of any diamond. Ratios for radiant cut diamonds depend on personal preference. The most common ratio for a traditional, rectangular shaped radiant cut diamond is 1.25 although ratios range from 1.05 – 1.50. For a square radiant cut, a ratio between 1.00-1.05 is ideal. While radiant cut diamonds don’t have an official cut grade, the chart below offers a general guide on how to choose the cut of your radiant diamond. What colour is best for a radiant diamond? Evaluating colour in radiant cut diamonds is entirely dependent on the preference of its buyer or wearer. Diamonds in the colourless range (D-F) carry a premium due to the fact that they are incredibly rare, but the truth is, the difference between the colourless and near colourless (G-J) grade ranges is difficult to perceive, especially to the naked eye. What clarity should I choose for a radiant cut diamond? When diamonds are formed deep in the earth, they develop clarity characteristics–slight irregularities visible under 10x magnification. Depending on the size, quantity, placement, tone or colour of these clarity characteristics, they may or may not be visible to the naked eye. This is one of the reasons why a truly flawless diamond is so rare and carries a price premium. 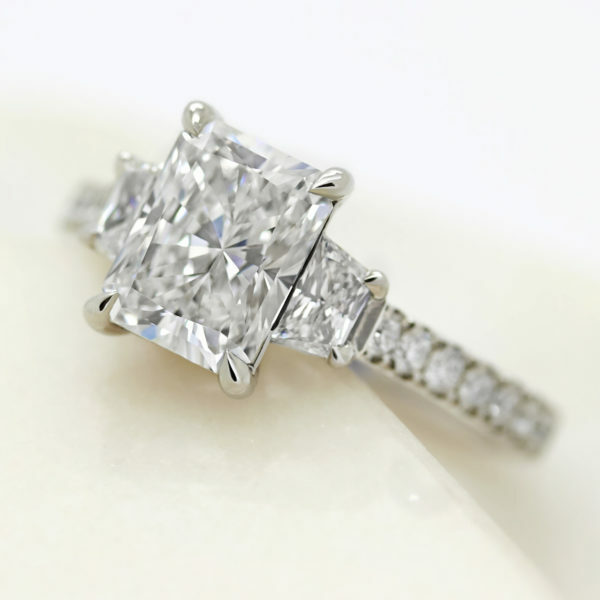 When it comes to choosing diamond clarity, the choice is yours. 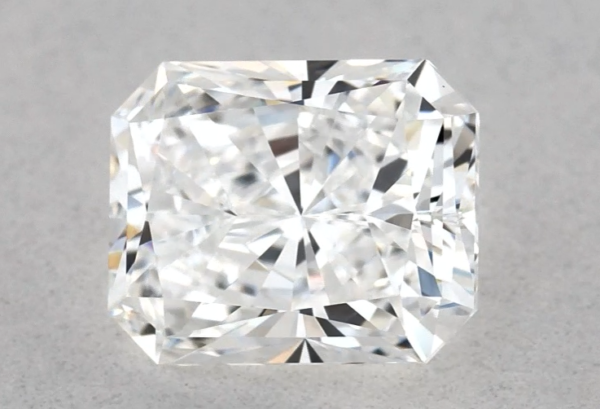 Some may be happy with a diamond that features clarity characteristics that aren’t visible to the naked eye, while others desire absolute perfection with a technically flawless clarity grade. Due to their extra facets, radiant cut diamonds disperse more light throughout the diamond, giving clarity characteristics (inclusions) more places to hide. For this reason, you can consider choosing a lower clarity grade.